From a technical standpoint the NEC DT730 24D VoIP phone is very similar to other DT730 models (DT730 12D and DT730 32D). The key difference between them is the number of programmable one touch buttons available – 24 for this phone. The 24 buttons come with multi colour LED’s attached. You can customise the buttons to show staff, phone lines or functions and easily see at a glance the status if they are busy or available with different colours. With so many buttons this handset is designed for managers, even reception staff in smaller companies with less than 24 staff. Many IP handsets don't comes with so many buttons and instead have everything shown on large display screens that you need to scroll between to see. In many ways this design is actually easier for day to day use. If you need more than 24 buttons you can always step up to the NEC DT730 32D IP phone. This 24D is part of the NEC DT700 IP series handsets. The NEC DT730 24D IP Phone is easy to use and very well designed. Unlike the cheaper NEC DT710 6D phone the LCD screen is also backlit for easier viewing in all light conditions. Below the NEC DT730 24D display screen there are also 4, very handy, contextual buttons. They display logical onscreen options depending on what function you're accessing on the handset. For example, if you are using voicemail it will show options like replay, delete, save etc. The logic is intuitive and makes daily phone use for the 24D much easier. To the right of the context keys there is also a help button. Why more manufactures don't do this is beyond us. NEC offers users a help function that basically has the user manual programmed in. So no matter what you're doing you'll never be at a loss as to how to do something on the phone. It's very clever and simple to use. The NEC DT730 24D VoIP phone is also equipped with a silver jog dial button for fast navigation of features like redial, system speed dials and more. It is located on the bottom right of the handset console. If your staff are constantly calling key suppliers or customers they can even program one or more of the 24 buttons available with speed dial umbers for one touch calling. With many handsets that have lots of programmable buttons you still get paper label inserts to write names on. The DT730 24D is no different and is one of the few drawbacks of the NEC IP range (except DT730 Desi Less and DT750). Other manufactures have opted for on screen displays on their IP handsets for this reason. The sound quality on the NEC DT730 24D phone is excellent. You get advanced audio features like full duplex and wideband audio. Full duplex allows for awesome speech on hands free conference calls and acts the same as expensive Polycom conference phones. In small meeting rooms you could easily use this handset for basic conferencing needs. The wideband audio, as opposed to narrow band, is not typically available on cheaper IP phones. This is a less compressed voice delivery method and delivers a premium, high quality IP voice experience for users. The DT730 ITL-24D phone comes standard with two 10/100MB LAN ports as well as the option of a Gigabit adaptor. With two ports you can connect your PC to your NEC DT730 24D IP handset and run both from the single Ethernet connection. If you already have existing ports for both phone and data you don't need to use the second port on the DT730 ITL-24D handset and it can free up additional capacity in the office for extra staff. No matter which type of environment you currently operate, or may in the future, you're covered with the Gigabit adaptor option. Most IP handsets, including this 24D option, allow for simple plug and play registration. What this means is you simply plug the DT730 24key handset into a spare, live Ethernet connection and the handset will automatically register. Once you've logged in it then present on screen all your user settings and customised handset programming - even your extension number. This is a great feature for companies that have staff that move around or hotdesk. You can login to any Ip phone in the office. If you have remote staff using IP handsets the same logic applies as long as their IP address credentials have been set up in the pbx. As the NEC UNIVERGE SV8000 telephone system series are all hybrid you can connect IP as well as digital and analogue phones as well. Handsets are perhaps the largest cost component of any system deployment and mixing and matching is the easiest way to keep costs down. If you already have separate phone and data connections from a previous phone system then you can choose phone handsets. Perhaps the biggest misunderstanding for companies moving to VoIP for their phone calls is they also have to get IP handsets - this is not the case. In many instances there can be no tangible benefit to the end user and IP phones are more expensive. The benefits of IP handsets are limited to remote users, hot desking situations and limited port availability in the office. Outside of that businesses function perfectly well and still access all the normal system features with cheaper digital phones. If you are considering phone handsets then you should check out the NEC DT330 24D digital telephone. It is physically identical to the NEC DT730 24D IP Phone and the only difference is it doesn't contain a built in network switch for the IP connectivity. Being physically identical also makes mixing and matching to reduce costs much easier as you won't have different looking phones in your office. The NEC DT730 24D VoIP phone is easy to use with the customisable 24 buttons, intelligent, well designed and a very good handset for high powered users. Infiniti Telecommunications is not affiliated with the manufacturer of this product in any way. 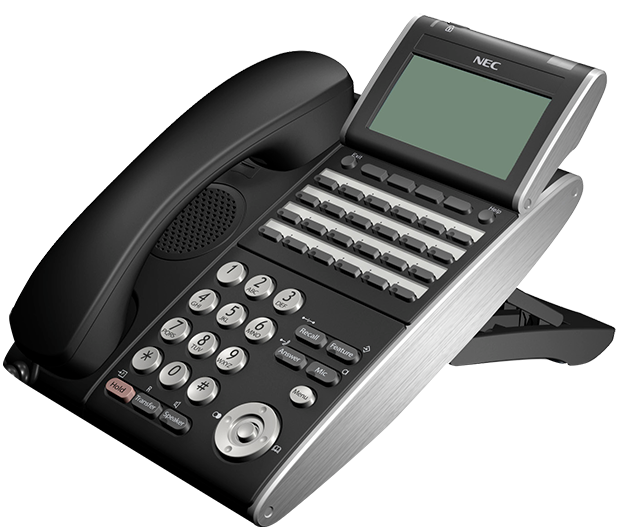 Looking to learn more about NEC DT730 ITL-24D IP Phone Handset?